London based seed fund, EcoMachines Incubator invests in robotics platform. EcoMachines Incubator, the London-based seed fund and accelerator focused on advanced engineering, today announced its investment in Q-BOT Ltd., a company that has developed a robotics platform that can access, survey, evaluate and apply treatments in a wide range of industries and applications. The initial problem Q-BOT aims to solve is the difficulty of applying insulation underneath flooring in old houses. The majority of the houses in the UK that date from the 19th century and early 20th century have suspended timber floorboards. These floorboards are poorly insulated, leading to loss of heat, drafts and discomfort for residents. Current methods are expensive, time-consuming and disruptive, requiring the residents to move out of the property for the duration of the work. 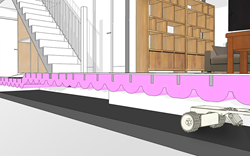 By entering the narrow space between the floorboards and the ground, Q-BOT’s robots can spray insulation in a place that human workers cannot reach. This demonstrates the potential of Q-Bot’s robotics platform to perform tasks that are too expensive, impractical or dangerous for unassisted human labour. Using the platform, the operator directs the robots to perform a survey of the target area, but the robots make their own assessments about the best way to apply the required treatment to the particular location, whether insulation or another enhancement. Q-BOT is exploring a pipeline of other valuable market applications that can be addressed through its platform in the building and infrastructure industries. EcoMachines Incubator is an investment fund that backs early stage hardware companies, with a focus on energy, cleantech, resource efficiency and industrials. Companies typically receive initial investment as part of its Accelerator programme, which includes seed investment, mentorship, support in building industry partnerships, and help with increasing the investment readiness of the companies. EcoMachines can also participate in Series A rounds, where EcoMachines can add value over and above its investment. The next quarterly deadline for applications for entry into EcoMachines Incubator’s Accelerator programme is on 31st July 2014. You can find out more on http://www.ecomachinesincubator.com. Q-BOT develops robots for the building and engineering industry, assisting human labour where there are significant cost or health and safety benefits. Their first application is in underfloor insulation for Victorian and early-20th century housing, leading to significant decreases in heat loss and improvements in comfort levels for residents. Q-BOT’s devices are small enough to enter the underfloor space and apply insulation from below. The robotics platform can be extended to a range of other application in the building and infrastructure industries. Q-Bot has won multiple grants and awards, including from the TSB, DECC and local authorities. Q-BOT was started by Professor Peter Childs, Imperial College and serial entrepreneur Tom Lipinski with the objective of using robotics and advanced manufacturing techniques to revolutionise the building and construction industry. The company is funded through a combination of government grants, private investment and sales revenue, and has been supported by Climate-KIC, The Technology Strategy Board and The Department for Energy and Climate Change. The company is based in Wandsworth, London, with a growing and multi-disciplinary engineering and management team. You can find out more at http://www.q-bot.co.